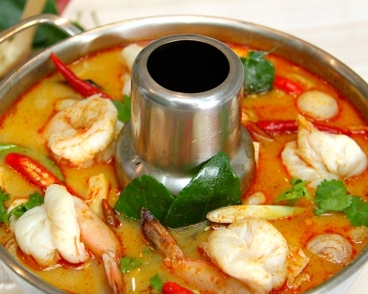 Tom Yam Gung (ต้มยำกุ้ง) is a delicious spicy soup with shrimp / prawns. Here I will outline what you need to make it and how to make it. It’s an easy recipe. Enjoy it is truly delicious. 1. Bring a pan of water to a boil. 2. Prepare the shrimps by peeling and removing the shrimp’s vein. 3. Cut up the Thai parsley and galangal. 4. Slice the lemon grass, 5-6 inches long. Pound the lemon grass to soften. Place the lemon grass and galangal in the boiled water and continue to boil for 5 minutes. 5. Add the lime leaves to the pot. 6. Cut the mushrooms in half and then add them to the pot. 7. Then add the shrimp. Wait for a few minutes and turn off the heat. Now add the Thai parsley. The shrimp will cook in no time at all. 8. Serve the Tom Yam Gung ต้มยำกุ้ง into bowls. Add the fish sauce, lime and chili to taste. Then add the naam prik pao. 9. Be warned this can be very spicy so taste a little at a time until you get used to the flavor.